November 6, 2013, 4:30 PM · Made in Germany, banned in Germany, burned in Germany. Revived in Germany. 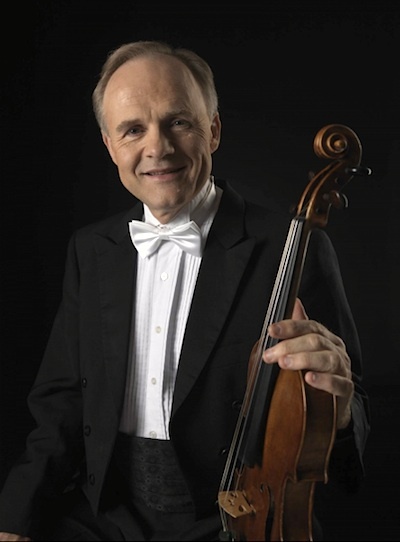 For his most recent recording, Made in Germany, German violinist Herwig Zack has put together a program rich in meaning as well as in virtuosic playing. It's a thoughtful collection of solo violin works that includes Paul Hindemith's complete works for solo violin (three sonatas and an unfinished fourth), as well as Johann Sebastian Bach's G minor Sonata; Max Reger's G minor Chaconne, and a new work by the living German composer Klaus Hinrich Stahmer called Gerettete Blätter, or "Saved Pages," inspired by music and literature suppressed by the Nazis. "This year is the 50th anniversary of Hindemith's death, and we've heard very little Hindemith, even this year," Zack said during a phone conversation from Germany last month. Zack has made many recordings, most recently two other programs of solo violin works called Essentials and Four Strings Only. Zack is Professor for Violin and Chamber Music at the "Hochschule für Musik" in Würzburg. He studied in Germany with Karl-Albrecht Herrmann, Edith Peinemann and Max Rostal; then in the U.S. at Indiana University with Josef Gingold. Zack's relationship with the music of Hindemith began early, and close to home. Hindemith, born in 1895, trained as a violinist and composer at the Hoch Conservatory in Frankfurt -- the same school where Zack began his musical training a half-century later with Herrmann. "Hindemith was the leading 'Frankfurt' figure," Zack writes in the program notes for the CD. "It went without saying that we would play his works -- it was simply a matter of course. When I was 15, I had in my repertoire the Solo Sonata Op. 31, No. 2; within a year I had added its companion work, Op. 31, No. 1." But Hindemith's life and music were entangled in the troubles of the early 20th century, and its acceptance has been complicated by many things, among them, the fact that it was banned by the Nazis. 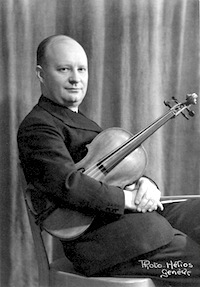 "By the beginning of the 1920s, (Hindemith) already enjoyed a reputation as one of the leading avant-garde composers of his generation," Zack wrote. "As an exponent of specific 'modern' trends, he was regarded -- something hard for us to comprehend today -- as a musical enfant terrible…After the Nazis seized power in 1933, his music was vilified in Germany as 'degenerate art.'" Though Zack described his CD as being bound by Bach; I saw another thread running throughout: the broken trajectory of the early 20th-century, German avant garde movement. From Bach forward in this CD, tonality moves to atonality, a robust kind of new music emerges, then the music fragments. The CD's one modern piece, written especially for Zack, makes new music from fragments of pieces that were banned -- a kind of re-composition, a rebuilding. What a fascinating journey! It begins with Johann Sebastian Bach, his Sonatas and Partitas -- music that is at the core of our violin repertoire. "The Sonata in G minor, the shortest work in the cycle, could in several respects also be considered the most self-contained and rigorous, the most perfect of the six," Zack wrote. "It is not surprising that, more than any of the other Sei Solo (except the Chaconne), it has served as a model of form and design for a wide range of later composers, among them Ysäye, Reger and Hindemith." And beyond that, it is virtuosic. For example, the last movement, the "Presto." "The main point for me of this movement is the dance-like impulse and the unbelievable driving virtuosity of it," Zack said to me. "We were taught in our times that you can't play Bach 'virtuoso' -- that's nonsense. It's the high point of Baroque virtuosity, absolutely. If that isn't virtuoso, then I don't know what is. It doesn't mean you're supposed to play it like Paganini or Ernst; it is Baroque virtuoso. The virtuosity of these pieces derives from the virtuosity of the composer, because these pieces are composed perfectly." "Of course the conception has changed drastically during the last 30 years or so," he said. "I very much grew up with Bach interpretations by Henryk Szeryng and Max Rostal, and of course it took a long time to adjust to a more modern picture of Bach. One of the key influences for me was not a violinist, it was (the pianist) Glenn Gould -- his art of articulation. For me, that is one key point in Bach interpretation: it's a much more articulate kind of playing now than one used to do in older times." We move from Bach to the complete works for solo violin by Hindemith. Zack includes the two sonatas that he has played since childhood, both Op. 31 No. 1 and No. 2. Interestingly, the third full sonata on this disc, Op. 11/6, was discovered, or recovered, only very recently, despite the fact that it was written nearly a century ago. "Hindemith wrote this piece in 1917 and 1918, during World War I," Zack said. "Later, he included it in his work listing and wanted to give the piece Op. 11 No. 1, but then he gave 'Op. 11 No. 1' to a violin-piano sonata. This piece remained unpublished. The question is, why? I don't know why; it's a wonderful piece. Of course, it is the work of a young, not 100-percent mature, but ingenious, composer. Later, when he died, they found the manuscript of the third movement and the last few bars of the second movement, but the rest was thought to be lost. I don't know where and how, but somehow around the time of the turn of the millennium, a copy of the whole piece surfaced, including the first movement and the beginning of the second. Since that time, the piece has enjoyed increasing popularity." Personally, listening to the piece, it reminded me of certain harmonies in the solo sonatas by Ysäye. "What is similar to Ysäye is the reference to Bach," Zack said. "And it's very similar to Reger in some ways, too. It is tonal, but it's tonal in a way that he's straining tonality to a point where tonality reaches its limits. For me, much of it sounds like Reger, but it seems like a Reger who, during the course of the war, seems to have lost somewhat his inner compass. With Reger, you find he goes to the limits of tonality, but you have the feeling that deep inside, he's very convinced there is order somewhere, and everything will be all right. But this piece by Hindemith is does not have that conviction. The last movement is very daring; not only is it extremely virtuoso and very difficult, but there's a certain violence in it -- if you could imagine Bach being put into the trenches of World War I -- that's a daring comparison. But the times were changing, and what was a secure thing yesterday, what was right yesterday, was not right any more, at that moment. You'll find that, in many pieces that are composed around that time." After the three full Sonatas by Hindemith comes a "Prelude and Fragment." "It is an unfinished piece," Zack said. "He started to write the first movement of a solo sonata in the early '20s, and he finished the first movement. He started the second movement, a slower movement; and then he dropped the idea." In 1922, during a trip to Norway with his quartet, he re-wrote the Prelude and dedicated it to the violinist Thorwald Nielsen, a quartet-mate in the Amar Quartet, in which Hindemith played viola. (By the way, Hindemith's primary instrument was the viola, and violists might recognize bits in this piece from his Sonata for Solo Viola, Op. 25, No. 1). But the rest of the Sonata was never finished, and the second movement trails off. "The way I placed it on the CD, it's not incidental," Zack said. "This short, expressive fragment by Hindemith -- it ends in nowhere, like some unfinished piece of music. That's actually precisely where Klaus Stahmer picks up with his piece -- integrating fragments of this and of that, and making something completely new out of it. I very much like this piece, I must confess." The idea for Stahmer's piece began when he met Zack after a concert, and they struck up a conversation about politically ostracized composers. "I played a concert with some colleagues, commemorating the ninth of November 1938, the Nazi pogrom, and and Klaus Stahmer was there," Zack said. "Afterwards we got to talking about composers that were dubbed 'degenerate' in Germany during this infamous period. He had wanted to write something for me earlier, but it had never really materialized. I was very surprised when, two weeks later, I met him and he said, 'I have your piece!' (He laughs) Something 'clicked,' as he put it." The piece draws on the idea of a book burning -- "He's imagining he's passing a pile of burning books, and there's music in it as well. He pulls out pieces of handwritten pages, and tries to figure out what they were." Did the Nazis actually burn music? "They didn't burn music, but they forbid it," Zack said. "Hindemith was forbidden, Ben-Haim had to emigrate, of course. Schoenberg was forbidden, and many others -- everything that had to do with real avant-garde, or what they perceived as avant-garde, and music by Jewish composers." Zack ends his recording with the G minor Chaconne by Max Reger (1873-1916), a seven-bar theme followed by 28 variations. Of course it is inspired by Bach's Chaconne. And Reger's relationship to Hindemith? Hindemith said of the composer, "Reger was the last giant of music. Without him, I would be unimaginable." "I think Reger, in general, is not played enough nowadays," said Zack, who calls the Chacconne Op. 117 No. 4 a masterpiece that "offers violinists ample scope for displaying all aspects of their skill without ever lapsing into self-indulgent or superficial acrobatics, the virtuosity always embedded in the musical context and growing out of it convincingly." Zack said he hopes that "Made in Germany" will help violinists find their way to these composers and explore these lesser-played works. "For me an essential quality of an artist is that he has a certain curiosity, that he digs in the repertoire and is interested in things that lie a little off the main road," Zack said, "because there's a lot to discover." I worked on the Reger unaccompanied Violin sonatas a lot after reading about Milstein admiring them. The Master even said that studying Reger helped with his unaccompanied Bach if my memory serves me correctly. Anyways they are abolsute masterpieces in my opinion.